Loving Sai Ram and greetings from Prasanthi Nilayam. For quite some time, I have been thinking about revisiting the famous Vahini series of books written by Swami decades ago. In the early years when books on Swami were very few, people took eagerly to those written by Swami Himself and, as a result, the Vahini series became quite popular. However, as the years rolled by, books written by devotees began to appear in large numbers, and since these invariably contained the ever-popular “experiences”, slowly devotees began to forget the Vahinis. And soon there came a time when people did not even know that such books existed! Over here, we made sure that at least our students did not suffer through such ignorance. This we ensured by anchoring the so-called Awareness Classes for the undergraduates to the various Vahinis of Bhagawan. But where the wide world was concerned, the ignorance about the Vahinis not only persisted but in fact grew to astronomical proportions. I am personally concerned about this unfortunate development because when people sideline the direct teachings of the Avatar even when He is not physically amidst us, then it is something pretty serious. What is even more disturbing is the growing belief that teachings of Swami need not be taken seriously, except those convenient to us. Particularly where Dharma is concerned, this coolness is alarming. This is what is called the slippery slope. First you shrug off paying bribes, even though you do not like it one bit. Then you try to legitimise with it with suitable arguments. In many cases where direct corruption is not involved but some kind of unethical action is, powerful lobbies try to see if money power can be used to get legislation passed so that illegitimate and immoral activities get legal sanction. If you look carefully at many of the issues connected with intellectual property, patents, and even international trade laws, you would find there is amazing and blatant one-sidedness. I do not want to get embroiled in a debate on these kinds of issues; but this much I shall and will say: No matter what, we simply cannot afford to be a party to the violation of Dharma, indeed, under any circumstances. This of course is likely to raise hackles, and this precisely is where I wish to bring in the Vahini series. Through the present series of broadcasts, I wish to recall in simple language, to listeners young and old, some of the things Swami wrote and spoke about passionately in former years. May be at this juncture, I should say a few words introducing the Vahini series itself. Soon after the present Mandir was established and devotees started coming in larger and larger numbers, Swami founded the Sanathana Sarathi. For decades, it was the lifeline and the umbilical cord for devotees to get spiritual nourishment, once they left this place. Apart from a presentation of the Divine Discourses in print form, an activity that continues to form the core of Sanathana Sarathi to this day, Swami, in response to numerous requests, including from late Mr. Kasturi, started writing articles on specific themes, like Dharma, Prema and so forth. In due course, these individual articles were compiled and packaged into books, and that is how the Vahini series came into existence. It is the authentic Voice of the Divine Phenomenon, that is setting right the moral codes and behaviour of millions of men and women today. Baba's Love and Wisdom know no bounds, His Grace knows no obstacle. He is no hard taskmaster; His solicitude for our welfare and real progress is overwhelming. May this book reveal to you the Mother's love which has made Baba write it, the Father's authority which backs every junction therein, the Teacher's illumination that lights up every statement, and the Lord's sublime Universality, that invites you to expand your personality into a great Instrument of Service. That was what Kasturi said of the Vahinis, and that also concludes my general introduction. Let me now tell you what exactly I am planning to do. Basically, I am going to present a selection of passages from the book Dharma Vahini, written in Telugu by Swami Himself and translated into English by Prof. Kasturi. From the copy of this book that I have, I am not able to find out when exactly the first edition of this book was published; however, that is not so very important. Dharma is eternal, God is eternal and when God in human form speaks about Dharma, we had better sit up and take serious notice; that is what motivated me to doing this particular musings series. Where Dharma is concerned, I can go to town since I feel so passionately about it! However, that is NOT my objective here. Rather, I wish to bring to your notice, what Swami said in His classic, Dharma Vahini. As I mentioned earlier, I am offering only select extracts; I do hope this series would induce at least some of you to go to the book itself and read it carefully. As far as I am concerned, I have selected a few passages that I personally feel are important and simply cannot be ignored. Clearly, such a preferential selection does involve a bit of bias but then this way, I have the flexibility of offering additional comments without making the entire exercise pretty heavy for today’s audience. I do hope you would accept this rationale of mine. Man must dedicate himself to Dharma and be engaged always in Dharma so that he may live in peace and the world may enjoy peace. He cannot acquire real Peace, nor can he win the Grace of the Lord through any means other than the Dharmic life. I hope you get the message. To be eligible for Divine Grace, we must all follow Dharma! You might wonder: “What is this Dharma you are talking about? How do you know I am not already following Dharma?” Good questions! In answer to the second question let me say, I honestly do not know who is following Dharma and who is not. All I am trying to do is bring to your notice what Swami wrote a long time ago. Sure I have not yet explained what precisely Swami means by Dharma; but then, that is what this series is all about! Dharma is the foundation for the welfare of humanity; it is the truth that is stable for all time. When Dharma fails to transmute human life, the world is afflicted by agony and fear, and also tormented by stormy revolutions. When the effulgence of Dharma fails to illumine human relationships, mankind is shrouded in the night of sorrow. Let us pause and ponder a bit. I am not making this up; this phenomenon of parental neglect is quite common. It is almost a fact of current life. I am sure the sons and daughters would have their own side of the story, but I am not concerned with individual stories; I am concerned with Dharma and what Swami has to say about it. This anguish and concern on the part of Swami reflects the fact that Dharma, which once was taken for granted and regarded as part of our moral genes so to speak, has now been almost forgotten. What is even more alarming, I find that many people, especially the young, tend to feel that Dharma, while nice to talk about, will not work. God is the embodiment of Dharma; His Grace is won by Dharma. He is ever fostering Dharma, He is ever establishing Dharma, He is Dharma Itself. In the scriptures of the various religions, Dharma is elaborated in the language familiar to the adherents. The stream of Dharmic activity should never run dry; when its cool waters cease to flow, disaster is certain. The message is loud and clear: we just cannot afford to forget the practice and sustenance of Dharma for even a second because Dharma is nothing but God Himself, a fact asserted by Swami Himself. I know you are getting a bit impatient, wondering why I don’t explain what exactly this Dharma is so that you can get a better idea of what it is that you are supposed to swear by. So here it comes! What is meant by Dharma? What is the essence of Dharma? Can man, common man, lead a happy life and survive if he sticks to Dharma? These doubts confuse the mind of man naturally in the course of his life. Solving them is necessary, even urgent. As soon as the word Dharma is mentioned, the ordinary man takes it to mean: The giving of alms, feeding and providing lodging to pilgrims, etc., the adherence to one’s traditional profession or craft, law-abiding nature, the discrimination between right and wrong, the pursuit of one’s innate nature or the freaks of one’s own mind, the fruition of one’s fondest desires, and so on. Whoever subdues his egoism, conquers his selfish desires, destroys his bestial feelings and impulses and gives up the natural tendency to regard the body as the self, he is surely on the path of Dharma; he knows that the goal of Dharma is the merging of the wave in the sea. Well, if we pay careful attention to the many Discourses of Swami, we would find that a good many of them revolve around the dangers of body-consciousness and why we should avoid it meticulously. I am sure you would be taken aback to hear that but that is what it is! And this is where the entire issue of body-consciousness comes into the picture. We all think we are the body. Sure we have a body and the body is very important; otherwise, God would not have given it to us. At the same time, we must realise that the body has been given so that it can be an instrument to achieve the purpose of life, as spelt out for us by Swami. In other words, we should not think the body is given for pandering to it and as an instrument for the pursuit of sensual pleasures, etc. Such aberrations occur when we become obsessed with the body and give it far more importance than it merits. If you are hearing all this for the first time – and it is likely that many of you indeed are – you might ask: “Listen, what is all this about body-consciousness? What else is there? Life is all about the body, is it not?” So it might seem to us, but those who know better say, “We are NOT the body! We are SOMETHING else! !” You might possibly not buy that but let me tell you that exactly is what Krishna told Arjuna five thousand years ago. That is what Swami reminds us of again and again. He adds that we should, realising that we are the Immortal Atma, act accordingly. In turn, this implies that while going through life, we must constantly strive to give up excessive attachment to the body, because such attachment would get us too much tied to the external world. With that rather long background, I guess you would able to appreciate the quote I now offer. The aim of Dharma is to make the individual give up the attachment to external nature and the illusion that the external world causes. Dharma must make the individual realise his or her True Reality or rather, un-realise what the individual has now taken as real, so that the life-principle may stand revealed in its genuine identity. May be that quote appears difficult to understand. It requires detailed explanation and may be I shall postpone the explanation to the second article. 1. The human being is really the Atma but with a dress called the human body [along with which, by the way, comes the all-important Mind]. human form not for frittering away life but for spending it such that we merge once and for all in God. 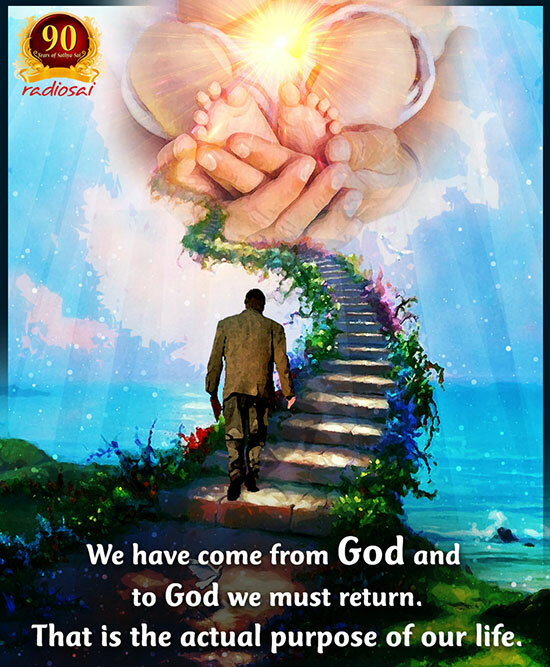 The simple rule is: From God we have come and to God we must return; that, you will recall is how Swami describes the purpose of life. 3. If we accept that statement about the purpose of life, it immediately follows that every action of ours on earth must be tuned towards moving in the Godward direction. 4. Dharma is the compass that helps us to move in that direction. 5. 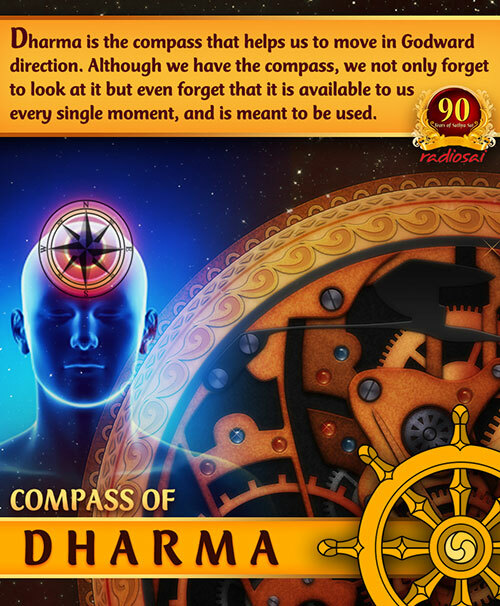 Although we have the compass, we not only forget to look at it constantly but even forget totally that it is available to us every single moment, and is meant to be used. When that happens, we get into deep trouble for sure. 6. What is it that causes such dangerous forgetfulness? In one word, it is body-consciousness. In practical terms, it means excessive preoccupation with the curios and fakes offered by the external world. For example, these days, many people, especially the young seem so preoccupied with telling all and sundry all about themselves via one of the numerous web sites created just for this purpose. They spend so much time sending text messages to each other, checking e-mails and what not. Do they spend even one minute thinking of God, their true nature and the purpose of life? You might wonder what’s wrong with all this. At the level of one individual, nothing catastrophic might happen but if indifference to Dharma spreads to millions and billions, then there can be trouble for all! These are some of the things that Swami said and wrote four decades ago. The book may be forty years old but Dharma, the subject on which Swami wrote, is eternal and ever relevant. In fact, I would say, mankind has never needed Dharma so desperately as now; and that is why I have ventured to offer this Musings series. So please do stay with us here in Radio Sai, as we slowly navigate through this most precious of Vahinis, the Dharma Vahini of Bhagawan Baba. Take care and may God be with you always. Jai Sai Ram. What do you think about this Musings? Please let us know by writing in to [email protected]. Do not forget to mention your name and country.